For a week or so, the self-appointed protector of this Cobble Hill tree on Henry Street has pleaded to some mysterious powers-that-be to "Not Put a Guard Rail Around This Tree." Today, some one did just that. Well, not a guard rail per se, but some orange plastic netting, which is perhaps as bad, and hints at a guard rail in the near future. Some curious stand-off in the making. The is the fifth edition of a new Lost City feature wherein I rummage through my library of old New York restaurant histories and cookbooks and dig up the prime dishes the denizens of the five boroughs dined on in years gone by. I know very little about Town and Country, a restaurant on Park Avenue that thrived in the 1950s, except that it stood exactly opposite the Waldorf=Astoria, and was the subject of a rather spectacular holdup in 1956 which left two robbers dead on the avenue. Here is their recipe for Maine Blueberry Griddle Cakes. It looks quite easy. Beat eggs and add buttermilk mixed with soda. Sift flour, baking powder, salt, and sugar into this mixture; then pour in melted butter. Fold blueberries into batter, and fry on a hot griddle. Serve with maple syrup and sausage and you have the perfect breakfast for a cold winter morning. The boast at the end is the recipe's, not mine. Though they're probably right. Previous "Recipes from the Lost City"
Or, Here's an Idea: Let Florent Come Back! When a reputable downtown restaurateur put in a competitive bid on the space a few weeks back, his offer wasn't even entertained. He was told the space had been leased; Grub Street has confirmed that a signed lease is now in place with another player, according to a source very close to Joanne Lucas, who owns the property. As for who this new tenant is, the facts are less clear. We asked one nightlife expert about the space and he said, "At the numbers she was asking, I'm hard pressed to believe that anyone with any market knowledge would have signed. She was asking $30k/month, so assume it's $20k. The taxes are very high there and you'd be required to basically rebuild the space. It's in very poor condition and hasn't been touched in twenty years." Nevertheless, two more sources named David Graziano and David Cabo, of the Pink Elephant and Bagatelle cabal, as the new lease holders. OK, so Lucas' restaurant failed. Why seek out new tenants, who would destroy the interior and, with it, what's left of the Florent legacy inside? Why not do the obvious thing and invite Florent to move back in and start up the old business like nothing had happened? I'm certain his patrons would return. What do you say Joanne? Can you admit you were wrong and make amends? Prove that what we naturally assume about landlords is wrong. Just a tiny hand-painted sign and some unusual window adornment mark the location of John's Custom Tailoring on E. 79th Street. I assume John operated just inside that window. Now Playing at the 84th Street Corner Deli! I find the appearance of this Upper East Side deli to be bizarre. Nothing inside is unusual. It's your run-of-the-mill neighborhood deli. But what's the story with the...well, I can only call it a marquee. This shop has the biggest, most imposing signage in delidom. Surely this space must have been something else in a previous life—maybe a movie theatre—because why else have that thing cantilevered ten feet out over the sidewalk? Certainly not only to protect patrons who get caught in the rain. One other peculiar thing about the sign. The "S" in "St." is so much bigger than the numbers in "84th" that, upon first glance, I thought the deli had been named after an obscure religious figure named "St. Corner." There will be a memorial gathering to honor the memory of Robert Guskind, the late webmaster of the popular blog Gowanus Lounge, on April 4. The event will be held from 2 pm to 5 pm Saturday, April 4, at the Brooklyn Lyceum, on Fourth Avenue between Union and President Streets in Park Slope. I encourage everyone to attend. For more information, and to RSVP, go to Gowanus Lounge. The identity of this romantically dilapidated corner store on Richards and Coffey in Red Hook has set my curiosity on fire for a few years now. I don't know why I didn't think of turning to the South Brooklyn Network for my answer until now, but that's just what I did this past weekend. The chatters there came up the information in mere hours. The gold-leafing of "Restaurant" in this window notwithstanding, this building housed a bar. 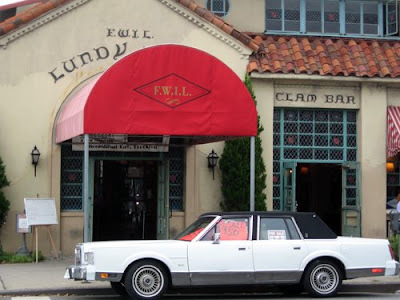 It was called Bud & Packy's (how's that for a memorable name), a pub run by Packy Laffan and Bud Fischer. It was popular with the workers from Todd Shipyards and Sucrest Refinery. It's been vacant at least since the 1990s. Can you believe that, according to the DOB files, this building has only had two complaints against it in its entire existence? Mayor Bloomberg has found yet another way to tear a good-sized rip in New York's cultural fabric. A few weeks back, he announced his proposal to bar automobile traffic from Times Square and Herald Square, allowing both areas to become the domain of pedestrians. Not a bad idea at all. But it has already had once unexpected, and thoroughly unwelcome repercussion. The Macy's Thanksgiving Day Parade can now no longer follow its historic route down Broadway, and is now being forced to contemplate a trip down the much less glamorous path of Sixth Avenue. Why the parade can't travel down Broadway for just that single day, I don't understand. Couldn't the rules be broken once a year for tradition's sake? The Macy's Parade is the only major parade that still uses Broadway, which, let's face it, is New York's most famous street. Sometimes I think there isn't a single thing about New York that Michael Bloomberg understands. And How Was Your Day at School? I was walking by the corner that used to belong to the City Lights Diner of Boerum Hill on Friday and noticed that it was no longer there. There is paper over the windows of the long space on the northeast corner of Atlantic and Third Avenue, and signs indicate the address will soon be the location of the Ocean View Diner. Ocean View—is that better than City Lights? Third Avenue is a long way from the ocean. The building has been painted a nice ocean-like hue of blue, to match its new identity. The Shreeji Deli, at the Carroll Gardens corner of Court and 1st, recently got a new awning. In taking the old awning down, the store reminded the neighborhood of the former occupant of the space. On the 1st Street side of the store, one can clearly see the outlines of letters spelling "Pepaw." This was once, in fact, the Pepaw Candy Store, a local hangout for the kids back in the day. Under the Court Street awning, you can see more faded letters, though they're not as clear. Before it was Pepaw's, it was another candy store called Sergie's. (This location was always a candy store of some sort, apparently.) There was a guy named Peter who made fantastic egg creams there, so I'm told. I have passed this little bodega on 9th Street in Gowanus many times, but always at night on the B75 when it was shut. I assumed it had closed for good a long time ago. But recently a biked by midday and it was open. Inside, they sell the usual deli stuff. They just happen to also served hot dogs and make that their claim to fame. They're not fantastic dogs; just the usual. But the staffer made a very pretty design in ketchup and mustard on mine that made me smile. The sign has a real retro look, doesn't it? As if it's been around forever? It's only nine years old. I still like it. There's a wonderful old stone wall lining the southeast corner of Kane and Henry Streets in Cobble Hill. It's rare that a wall should have a date inscribed in it, but this one does. Just above the eternally locked metal doorway placed halfway down the wall is the barely discernible year "1913." Which means the wall is a good decade older than P.S. 29, the public school that stands just across the street. It's actually a wall within a wall, since a cast-iron fence stands between it and the sidewalk. And there a curious shape of a cross on the metal door, which makes me wonder if the property was ever owned by Christ Church down the street. The wall has long been choked with dead vines, every inch of it. Some of them are quick thick and gnarled, others are thin and tendril-like I look looking at the wall. I imagine some terrible and terribly rich old miser lives within, or perhaps some hermetic widow like Miss Havisham. 37 Carroll Street, once a facade without a back, is getting pretty much done. Such quick work they've been doing lately. I wouldn't mind living in that penthouse jobbie on the top. But what of the old cornice that used to grace the older (original) facade. Will it return? How's this for a third-term campaign slogan for Michael Bloomberg? : The New York City mayor who closed down the most firehouses! Bloomberg's already shut down enough firehouses to earn the enduring enmity of the city, but now he's at it again. He's decided to close four more: Engine Company 271 near the Ridgewood-Brooklyn border will shut permanently on July 1 due to budget cuts; also closing will be Engine 4 in Manhattan, Engine 161 in Staten Island and Engine 73 in the Bronx—by July 1. The FDNY was ordered by City Hall to reduce its expenses by $95 million. The department also plans closures of 16 other FDNY units by Jan. 1, 2010. Hm. I wonder how long those firehouses could be kept open if provided with the millions Bloomberg plans to spend on his third-term campaign to be Mayor of the city he says he loves so much that he just has to be the leader of it for four more years. Oh, by the way, I've decided that Bloomberg is, at this point, so contemptible a figure that he no long deserves photographic images of himself. From here on in, he will be depicted on Lost City solely by crudely drawn, homemade caricatures. What's Going on With Casa Rosa? One year ago, it was revealed that Carroll Gardens' old red-sauce joint Casa Rosa was up for sale. Or the building was for sale. Which is the same thing, really. There was a nasty old Massey Knakal "for sale" sign on the side, saying it was a "development site." $3.3 million was the asking price. Well, here we are in March 2009 and the sign is gone, but the restaurant is still there. The listing is also gone from the Massey Knakal site. Could the eatery be out of danger? Each store deals with recession in its own way. At Sweet Melissa's, the pastry shop and cafe in Cobble Hill, it's by making sure the passerby knows its there—through the placement of sandwich board signs every ten feet. Hey—it worked for Burma Shave back in the Depression. 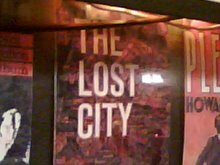 Lost City Asks "Who Goes to Lanza Restaurant"? My latest "Who Goes There?" foray for Eater took me unexpectedly to Lanza's on First Avenue. I hadn't planned to go there, but I was in the neighborhood and passing by and, it being dinnertime, I thought, "Why not? It fits the profile." Lanza’s Restaurant is easily the oldest eatery on the ever-morphing, East Village central alley of First Avenue. With the nearby John’s of 12th Street, and the DeRobertis and Veniero’s pastry shops, it forms a sturdy quartet of old-style Italian East Village eating traditions. Lanza’s, in some ways, comes off the most kitschy of the four, in part because of the stained-glass frontage and the trompe-l'œil wall murals of various famous Italian scenes (Mount Vesuvius, Lake Maggiore). But all those features are original, or near original, as is the tin ceiling, and, truth is, Lanza’s has changed very little over the years—as one couple who hadn’t been to the place in 20 years remarked on a recent evening. The place was founded in 1902 by Michele Lanza, who, if you believe the lore, was chef to Victor Emmanuel III. (If you were chef to the king of Italy, would you quit to open a small joint in New York’s then gritty Lower East Side?) Whatever his circumstances, Lanza must have been a culinary trailblazer; a 1935 menu indicates he was purveying a lot of Italian specialties then unfamiliar to American palates. The 2009 menu has changed a bit (more emphasis on pasta, and many fewer selections, if you can believe it; the old bill of fare was enormous), but it adheres to the classic southern Italian line-up: Chicken Scarpariello, Veal Scalopine, Trippa. The homemade gnocchi is prominently advertised in the window, and it doesn’t disappoint. Like the huge house meatballs, it stands up to the sauce and the teeth. The food in general, in fact, is a cut above the usual red-sauce joint fare. It’ll stick to your bones. Regulars, who like the way things are and want to keep things that way, sustain Lanza’s. Ninety percent of the clientele are repeat customers from the local area, my waiter told me. Old couples joke with the very attentive waitstaff. Younger couples drink sangria after sangria. Friends sit down with a “Here we are again.” Content parents take their (largely unimpressed) children. In fact, one of the few main changes to the dining room of recent vintage are a couple stained-glass panels the vainglorious Anthony put in sporting the initials “SA.” The Lanzas probably cast a fish-eye on that. The family still owns the building, by the way, and some of them evidently live upstairs. From time to time, they have parties in the space. That’s one way to keep an eye on the family business, even if you don’t own it anymore. Labels: east village, who goes there? The is the fourth edition of a new Lost City feature wherein I rummage through my library of old New York restaurant histories and cookbooks and dig up the prime dishes the denizens of the five boroughs dined on in years gone by. 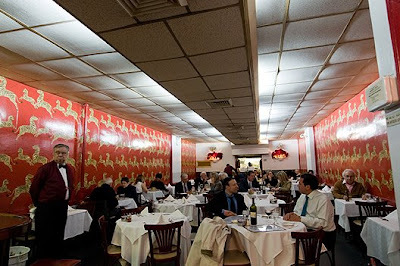 Longchamps was medium-size chain of Middle-Class, Bourgeoise, well-designed eateries in New York and Washington, DC. They were popular with wives and working girls in postwar America. The restaurants attempted to combine European elegance and American efficiency and did a pretty good job of it. The chain was popular enough that, in 1954, a cookbook was produced. Unlike other prominent restaurants of the time, Longchamps wasn't big on creating original dishes. Instead, it mainly offered its versions of classic European dishes, most of them French. One Italian recipe that sneaks in, in the chapter titled "Etceteras," is Spaghetti, Longchamps. (Spaghetti! How exotic!) It looks pretty standard, but may prove interested as an example of the kind of pasta dish New Yorkers ate in the mid-50s, and because of the inclusion of chicken livers and heavy use of butter. Here it is. Melt 3/4 cup butter in pan. Add onion, 2 shallots and garlic and brown. Add mushrooms and simmer for 5 and 6 minutes. Add tomatoes, tomato puree, sugar, bay leaf, allspice and salt and pepper. Simmer for 45 minutes. Remove bay leaf. Put 2 tablespoons butter in another pan. Add 1 shallot and chicken livers and saute for 5 minutes. Add this to sauce. Cook spaghetti; drain. Cover with sauce and Parmesan cheese. One note: the cook book's introduction notes that Longchamps always used sweet butter, so avoid the salted variety. They were also big on blanching their vegetables, so I'd do that with the tomatoes before peeling them. As to the mushrooms, my guess is, in 1954 New York, the button variety were the kind more commonly available. 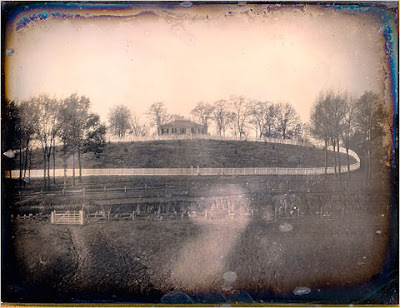 Harriet: I think we were so lucky to have had all the wonderful Mom and Pop stores in our neighborhood now a days all the Mom and Pop stores are disapearing because all the giants who can buy in large quantities and sell things for less money are snuffing them out. On my block alone Richards Street we had so many stores I can't remember them all and forget about Van Brunt Street they had double the amount. Lets see who can remember the names of some of them. On Richards street there was Volpie's, Mabel's candy store, John's Deli, Larrys Laundry, the Chinese laundry, Pop's Heros, Sweginnes Liquor, Dougherty's Bar, the shoe maker, Buddie's cleaners. On Van Brunt Street there was my favorite Tony's Pizza, Gambadell's Ices, Friedman's, A&P, Cullen's Bakery, mmmm good. Ok Peeps help me out if you can remember more of them. God Bless. Bobbie (Arlene): I don't know how far back your talking about, but here goes: Van Brunt St—Mester's Fish Market, Davidson's Pharmacy, Trunz Butcher Shop, Meyer's Candy Store, Patsy's Fruits & Vegetables, Willems Ice Cream Parlor, a Barber (sorry, can't remember the name. Sal's Butcher Shop, Taffy Dicks, Pimpenelli's Bar, Lombardi's Grocery Store. Oh well, add these to your Van Brunt Street list. I'll keep working on it. 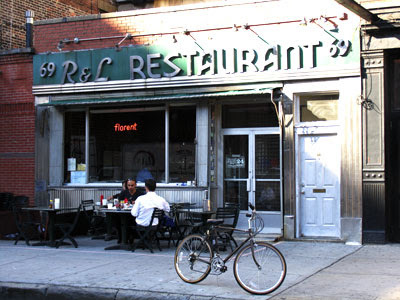 Richard St: You're right, there wasn't too much—Rosenman's Deli, Duh! I can't remember any others that you've already mentioned. By the way, my husband's Grandfather & Uncle owned the Shoe Maker. I'm still thinking. Paddy Finucane: Skippy Cleaners, the store next to Hans' (thrift shop w/the Captain,); Frank the barber, Sam's. Tom Galvin: On the corner of Pioneer and Van brunt Sal Afee's grocery store. On the corner of Pioneer and Richard Andy's candy store across the street from the old Pioneer movie. All those small, independent shopkeeps in one small, tight area. And today there's barely one business a block on Van Brunt and almost no businesses on the side streets. Not one of these businesses survive today. Leastways, I don't recognize any of the names, and I pass down those streets at least once a week. I think I'm going to have to revise my previous opinion that the new apartment complex going up on Columbia Street near Summit is not so bad. I don't know, but something inside told me, when I first laid eyes on it, that it would be some sort of belltower. The architect obviously has a grandiose streak. It comes out in the fussy brickwork, the balconies, the clock embedded in the facade. I think he would actually try for a belltower. Anyway, the folks in the neighborhood aren't happy. They're complained to the DOB, which wrote on March 18: "THE CONSTRUCTION SITE AT THE ABOVE LOCATION HAS PERMITS TOBUILD A 5 STORY BUILDING,BUT THEY ARE CURRENTLY ADDING A NARROW CINDER BLOCK TOWER TO THE TOP OF THAT STRUCTURE OUTSIDE OF APPROVED PLANS." There was then a complaint on March 21 that work was continuing despite not having the require DOB variance. And then there was a complaint that a strange, hunchbacked figure had taken up residence in the tower. Carrying on with my treatise that Lexington Avenue—the part of it that lies in the Upper East Side—is (for whatever reason) very adept at preserving its old businesses, I explored the stretch of it between 86th and 72nd Streets, the other day. Unlike the part of Lex between 72nd and 59th, which contains many a wonderful, but unsung treasure, this portion of the Avenue boasts a number of well-known and much-beloved shops. The 84-year-old Lexington Candy Shop, which serves egg creams and real malteds, perhaps tops the list of this category. Little ever changes in this misguidingly named diner, located at 83rd Street, except perhaps additions to the peculiar vintage coke bottle collection in the window. Lascoff Drugs, at 82nd Street, is a pharmacy so majestic and solemn, you feel like your entering a church when you go in. High ceilings, high shelving, a balcony, ancient Pharmacuetical relics, and silence. No music. You'll find many old and classic brands here that you won't locate elsewhere. It's been here since 1899. If that sign ever falls down, it'll kill someone. The Lenox Hill Grill, between 77th and 78th Streets, is all spanking new inside, but the sign and an old floor tile near the entrance betrays it at fully 50 years old. Eisler Chemist at 79th Street dates from the days when this area was crawling with German-Americans, though, again, only the sign and the name hint at its oldness. Further down the Avenue, between 75th and 76th Streets, the L&H Pharmacy was founded in 1964. William Poll, at 75th Street, is a bit of oddness that I hadn't known existed before last week: an 88-year-old, somewhat mangy-looking, specialty food store that feels vaguely English, and specializes in Baked Potato Thins and homemade dips to go with them. Dozens of dips. The facade stretches out over the sidewalk as a circular metal structure, a king of unofficial private bus shelter. Weird. Paul Mole, at 74th Street, is a sprawling, second-floor barber that's been in business for 100 years. They sell their own line of hair and shaving products. And there are barber poles of all sizes, upstairs and down. 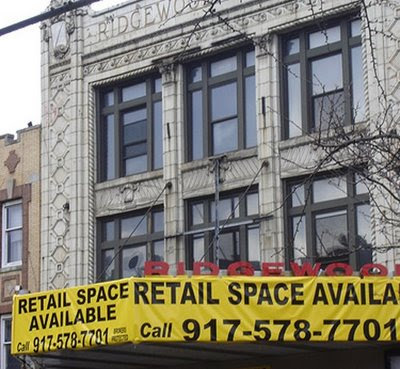 The outside half of the endangered Ridgewood Theatre may soon be a protected piece of work. The Landmarks Commission heard arguments on March 24 in favor of protecting the 1916 structure. Present was diner-saver-and-shipper-outer Michael Perlman who has made the former vaudeville house his latest cause. Perlman himself testified "on behalf of Friends of The Ridgewood Theatre as Chairman, and as Queens VP of the Four Borough Preservation Alliance Corp."
The man is nothing if not industrious. Perlman actually tracked down Tom Lamb, the great-grandson of Ridgewood Theatre architect, Thomas W. Lamb, and got him to provide testimony. Perlman also said that "The LPC claimed that if not for my role in submitting a Request For Evaluation form & accompanying research in March 2008, they wouldn't have known of the theater's existence," which is a little hard to believe. But you never know. When it comes to LPC incompetence, there is no bottom. A vote on the matter is expected in late spring. The theater may reopen in July as a mixed-use films venue and retail establishment. "For trade only," warns a sign outside the store on Third Avenue at 84th Street. Just as well. The mirrors inside are hideous. But the sign is great. The business is an amazing 98 years old, founded by Stefano Cavallo, then taken over by his son Stefan, and then his son Stephen. Think they like that name? R160s Unleashed on F Line? Back in October, Lost City reported the sighting of a sleek new train ferreting through the F train tunnels, thus sending racing the pulses of subway geeks everywhere. In-the-know trainophiles let people know that the trains, called R160s, were just being tested and it would be months until they were actually in service. Well, months have passed, and today we got this belated, completely unsubstantiated comment from the ever-popular Anonymous, crying, "HIPSTERS AND PARK SLOPE MOMS REJOICE! The R160s entered service in the (F) this morning!" No telling if there's anything to this, but, what the Hell—let's go with it! Can anyone else verify? I'll be taking the train later today, and will report back. On Tuesday morning, in a new poll from Quinnipiac University, Mr. Bloomberg was given high marks for job performance but was perceived by New Yorkers as cold and unable to relate to their problems. "Look, I’ve got a job to do. These are very serious times. There are no easy answers. I don’t find anything warm and fuzzy about the potential of people losing their jobs, or losing their homes. I don’t find anything warm and fuzzy about city government having to reduce expenses and find alternative revenue sources. That’s the job, and that’s what I’m going to do. I’m going to call them like I see ‘em. I will say that I don’t get any sense in the street of people being any less friendly than they’ve always been. I am what I am." It is a tragedy of public will that this man still polls well. I think some New Yorkers would still say he's doing a good job if he walked around with an axe and stepped on a puppy each morning. The New York Post found out why the developers of Sheepshead Bay's landmark Lundy's restaurant started taking a pick-ax to the exterior a while back. Because they were idiots! The team behind the Cherry Hill Gourmet Restaurant and Market to open in Lundy's has finally revealed why it ripped up part of the historic building's exterior - it didn't know the building was landmarked. Apparently, the architect hired for the project never checked city records. "Our architect did not do that," project manager Anthony Kelley told residents at last week's Sheepshead Bay/Plumb Beach Civic Association meeting, which was held in the famed Emmons Avenue building. As a result, workers replaced the concrete in front of the building with small, colored tiles and installed a black iron railing near Lundy's main entrance. Remember Your Friendly Neighborhood Landlord who last year kicked out the beloved Trusting Tailoring and Cleaning out of its longtime Cobble Hill home on Court Street, in hopes of getting a better-paying tenant? Well, there the space sits, empty, many, many months later. Good move, Mr. Greedhead. Enjoy those property taxes this year! Meanwhile, down the street, on Warren Street, is what used to be a lovely old carriage house. Not any more! Some proud property owner has gotten permission to build an ugly ol' bulkhead on top of it. The horses who used to live here never produced crap that looks as bad as that addition does. A tipster tells us that Gino, the Upper East Side Who Goes There vet that was reportedly on the brink of shutter, just renewed its lease for five more years with rent relief. A call to the restaurant confirms the renewal and that they don't plan on closing anytime soon. The development doesn't change the fact that business has been down 70% over the last two years, but at least the owners of the 64 year-old restaurant are going to try to soldier through. 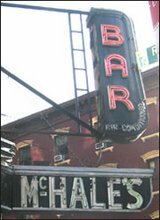 The is the third edition of a new Lost City feature wherein I rummage through my library of old New York restaurant histories and cookbooks and dig up the prime dishes the denizens of the five boroughs dined on in years gone by. 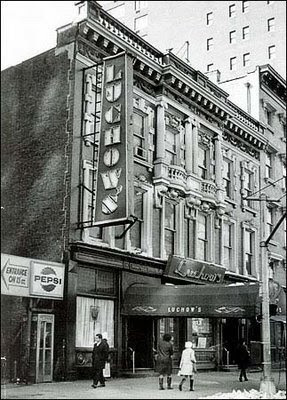 Luchow's, on 14th Street near Broadway, was the preeminent German restaurant in the city for the 100 years it existed (1882-1982). It was also a show business hangout during the days when Union Square was the center of New York's entertainment world. Everything at Luchow's was robust: the atmosphere, the hospitality, the music, the company, the music (there was an orchestra) and, above all, the food. There were no "lite" specials at Luchow's. If you wanted salad, there was Pickled Beef Head Salad. The Herring Appetizer included herring and 16 other things, including three hard-boiled eggs. And that was before you got to the shellfish and meat courses. And well before you got to the Filled Berliner Pancake or Apple Fritters in Wine Foam. Many of Luchow's celebrated entrees are accompanied by dumplings. An interesting aspect of the Luchow's cookbook, published in 1952, is that it boasts two house recipes for dumplings. For comparison's sake, I'm listing both here. Roll each dumpling lightly in flour. Cook in rapidly boiling salted water 15 to 20 minutes. Remove cooked dumplings from water; serve hot. Makes 12 or more dumplings. Wash, peel and grate potatoes. Soak bread in a little cold water; squeeze out as much water as possible. Mix bread, salt, pepper, onions and parsley. Add potatoes and eggs; mix well. Form into balls; roll lightly in flour; drop into salted boiling water (1 teaspoon salt to each quart water). Cover pot tightly; boil 15 minutes. Serve with sauerkraut, beef, or chicken. Serves 4 or more. The fates are steadily chipping away at Music Row. Less than a month after news came that Manny's, the W. 48th Street music institution, was closing in May, and further scuttlebutt that Rockefeller Center intended to make the entire block between Sixth and Seventh its second home, we see that the Department of Building has taken a mortal swing at 163-165 W. 48th, an old building that was until last week the home of Sam Ash's Sheet Music and Brass and Wind store. The store apparently acted quickly. A sign alerts customers that the Sheet Music department is now located across the street at No. 160. Inside, the place has been torn apart, with all things of value removed. Word on the street is that the hammers will start swinging away at No. 163 today. I don't know how old the building is, but it dates at least to the early years of the 20th century, and was a restaurant for most of its time. Go to the basement's fixture fire sale for a journey through a surreal retail cemetery. Is This Any Way to Welcome Passover!? Is This a Step Up, or Down?